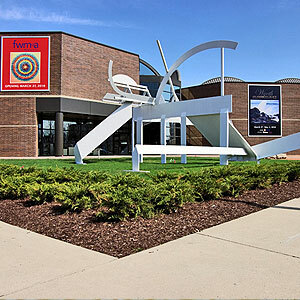 (Fort Wayne, IN) – Opening April 21, 2017, at the Fort Wayne Museum of Art are Juxtapozed and Robert Williams: SLANG Aesthetics!, co-curated by Andrew Hosner of Thinkspace Gallery, Gary Pressman of Copro Gallery, and Adjunct Curator of the Fort Wayne Museum of Art, Josef Zimmerman. The second installment of exhibitions Los Angeles’ Thinkspace Gallery has brought to the Museum to date, following the success of Invisible College from 2015, both showcase new and exciting work from the steadily expanding New Contemporary Art Movement. A continuation of Thinkspace’s mutually reinforced mission to garner institutional exposure and recognition for New Contemporary Art, its history, founders, key players, and artists, the exhibitions celebrate the impact of its most enduring media platforms, Juxtapoz Magazine, and the work of one of its most iconic trailblazers. Now widely considered the largest and longest running art movement in history, the New Contemporary Art Movement encompasses everything from Street Art and Muralism to Pop Surrealism and Hyperrealism. The New Contemporary Art Movement has been largely self-sustained through a network of alternative cultural platforms, primarily outside of the mainstream and institutionally vetted art markets, including social media, blogs, zines, underground collectives, galleries, and urban and alternative spaces. Copro and Thinkspace galleries in Los Angeles are two of the movement’s most visible and active proponents, taking the work to art fairs, collaborating with galleries internationally, and opening institutional channels for its exhibition and appreciation. Boasting 400,000 followers through its various social media outlets, Thinkspace has helped to bring the work to a wider international audience. As the movement continues to expand on a global scale, its diversity, inclusivity, and vitality set it apart from more exclusionary art world models. 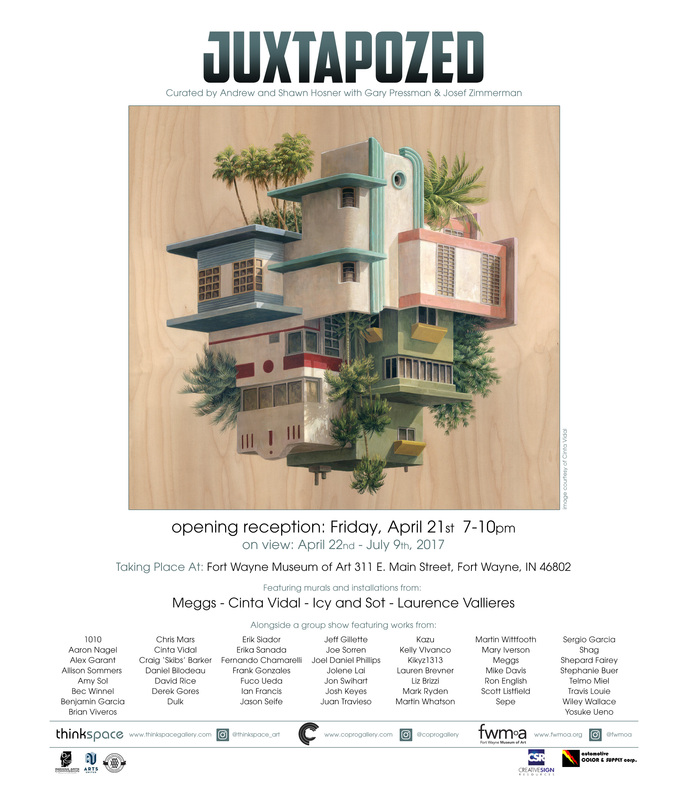 Juxtapozed, a show title drawn from the magazine of the same name in the imperative tense, celebrates the legacy made possible by Juxtapoz. The access the publication has facilitated since the early 90s to a widely cast variety of media and expressions, has shaped the movement itself and preserved its continued relevance. 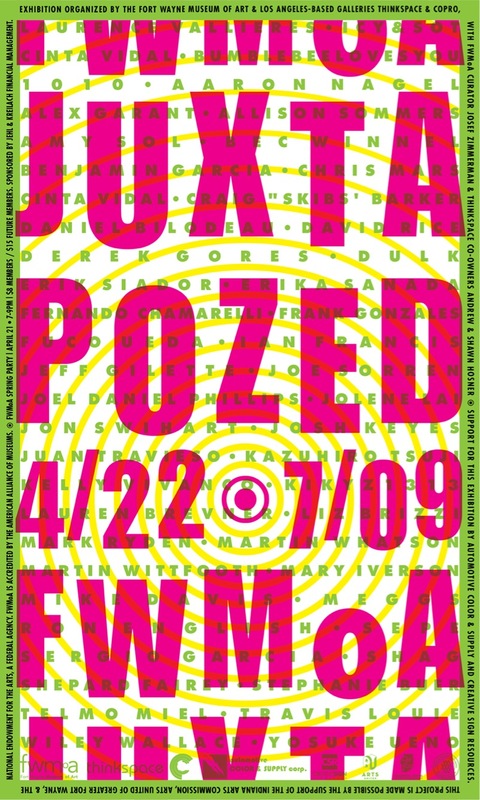 Founded in San Francisco in 1994 by Robert Williams, Craig Stecyk, Greg Escalante, Eric Swenson and Fausto Vitello, Juxtapoz evolved from the intent to foster and support the art and culture of the underground. The magazine provided an alternative voice and narrative as a counterpart to the dominant New York-centric discourse of contemporary art and featured artists who straddled the boundaries between “high” and “low” culture. Aligning itself with the aesthetics of contemporary street culture, figurative art, California car culture, gig posters, tattoos, graphics, psychedelia, and comics, the publication became a conduit and forum for an entirely new generation of artists who were latching on to a populist visual vernacular. Davis, Ron English, Sepe, Sergio Garcia, Shag, Shepard Fairey, Stephanie Buer, Telmo Miel, Travis Louie, Wiley Wallace, and Yosuke Ueno.